Uncover the haunted and ghastly throughout the DC area with these spooky ghost tours. 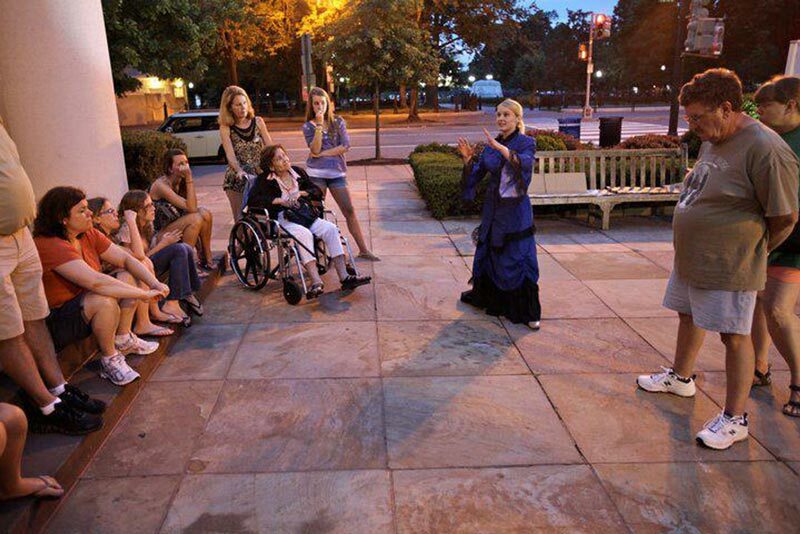 This Halloween season, consider a fright-inducing walking ghost tour through Washington, DC. The following tours, many of which are year-round, will have you delightfully spooked as you attempt to walk from haunt to haunt in some of DC's oldest neighborhoods. Fiat Luxe Tours offers comprehensive private expeditions that you can book at your convenience, and the company features a journey that is perfect for getting spooked. 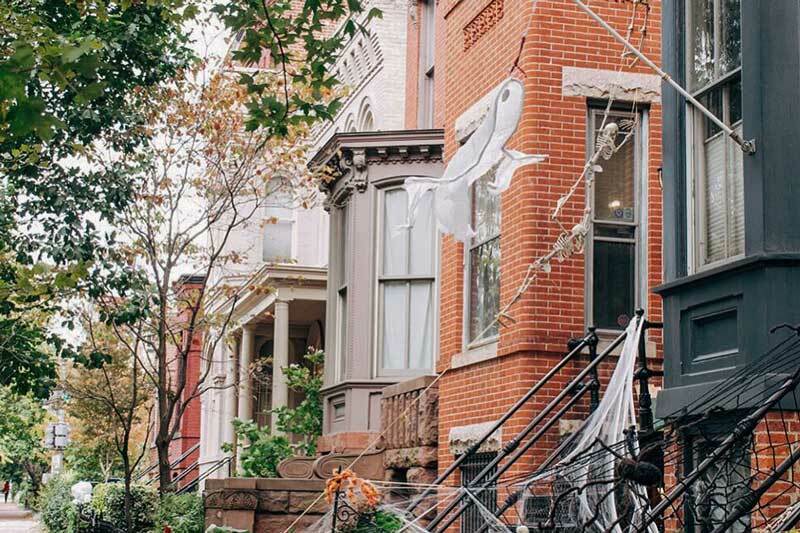 The Haunted and Historic Georgetown tour will dive deep into the creepy past of one of DC’s oldest neighborhoods. You’ll see the steps from The Exorcist, the eerie Oak Hill Cemetery, the Old Stone House and much more. There’s a secret souvenir in store at the end of the tour, so you’ll be rewarded for withstanding the scares. Book a tour. AmeriGhost boasts professional tour guides dying to show you the paranormal activity that haunts the nation’s capital. This trip through “Tragedy Square” (as Lafayette Park is known) includes stories of conspiracies, crimes of passion, duels and assassinations that have sparked a spooky presence in this historical section of DC. Capitol Hill Haunts dives into the disagreements among ghostly former lawmakers, dancing statues in the Statuary, a demon cat and the ghastly creeps that surround the Lincoln conspiracy trial. Tours run nightly, so there are plenty of chances to let DC's devilish past seep into your dreams. All ages welcome. Georgetown is perhaps DC’s most storied neighborhood, and DC by Foot brings out the darker side of this history with two awesome tours. Each one takes you behind the symbols of the past that shroud the area, revealing the ghosts and spirits that have called Georgetown home for hundreds of years (Wicked Georgetown is recommended for ages 14 and up). You’ll even get the inside scoop on curses, startling incidents, and those infamous Exorcist steps. Once you've got your bases covered, then try out the Dark Side of Dupont & Embassy Row tours covering curses, murder mysteries and more (these are also recommended for adults only). Reservations are required. 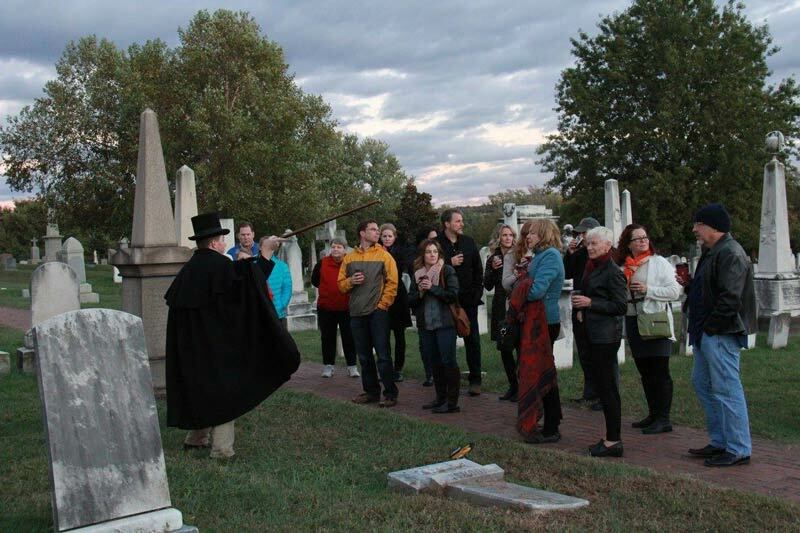 Once twilight dawns during Halloween season, you can join a creepy tour of Congressional Cemetery, which holds its own ghostly residents. Soul Strolls will reveal stories of people buried at the cemetery through guided tours led by costumed interpreters. The tours are spread out over four nights, so you’ll have plenty of chances to catch the chills at DC’s most historic resting ground. When: Oct. 19-20, 26-27. Tours every 15 minutes between 7-10 p.m. on Fridays, 6-10 p.m. on Saturdays. Book now! Scary DC boasts historically accurate and chilling public ghost tours, as founder Dr. Phillip Ernest Schoenberg is both a historian and an American government professor. Private tours are specialized to fit the needs of the group and include scandal-filled tales, stories of mysterious apparitions and more. You’ll hear accounts featuring some of DC’s legendary landmarks, including the Capitol Building, the Library of Congress, the Supreme Court and Lafayette Square. All ages welcome, except for the Haunted Pub Crawl. Lafayette Square and its historic spookiness is the subject of this tour offered by Washington Walks. The Square is populated with Hill staffers during the day, but is a quiet recluse once night falls. Learn of haunted tales concerning Navy hero Stephen Decatur, Henry Adams and his wife and the unforgettable night of April 14, 1865. You’ll also have a chance to see The Octagon, considered the city’s most haunted house and the starting point of the tour. When: Fridays and Saturdays in October, 7:30 p.m. Book now! The National Building Museum is famous for highlighting the greatest achievements in architecture. However, the building itself has a past filled with spirits and scary stories. From being the spot where the pensions of dead and wounded soldiers during the Civil War were handled to spirit sightings in the 1970s to shoes spotted underneath the floors, you will learn the fascinating and ghost-filled history of the building during these very popular tours. Book quickly! Nightly Spirits is a go-to for creepy, alcohol-accented tours, and this edition brings you to an area chock-full of history: Old Town Alexandria. Enjoy the small-town vibe, as stories and anecdotes will be shared at pit stops throughout the city during the two-and-a-half-hour tour. You’ll have ample time to grab a pint in the quaint, intimate bars, and still learn about the haunted places and buildings that populate Old Town. Reserve a spot before another skeleton takes your place. Or try the White House Pub Tour and bar crawl like a beast. Each tour includes three to four different stops, and you’ll have plenty of time to swill a drink of your choice while learning about the locale’s chilling past. Over the two-and-a-half-hour tour, expect to hear some distressing ghost stories along the way. Reservations are required, so make sure you’re booked to be spooked. White House Pub Tour: Meet at Occidental Grill, 1475 Pennsylvania Avenue NW Washington, DC 20004. Interested in more spooky happenings in Washington, DC? Check out these Halloween events in and around the District. How Do I Tour the U.S. Capitol and See Congress in Session? How Can I Tour the Monuments & Memorials in Washington, DC?